Crater Lake Rogue, a photo by The Bacher Family on Flickr. The "Rogue" in Crater Lake. Crater Lake National Park,Oregon, July 26, 2007. We lived and worked at Crater Lake National Park for almost four years, from early 1999 through late 2002, and I gave countless tours of the lake in this boat and three others. It was nice to go back on my birthday five years later and see again the extraordinary blueness of Crater Lake. 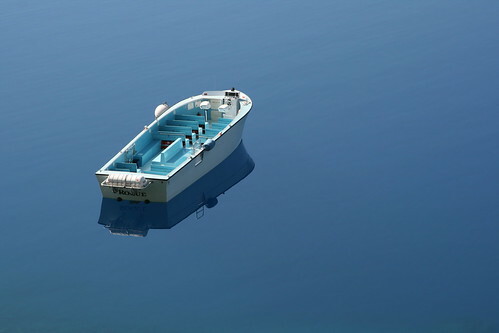 I took this photo near the docks, looking down on one of the unused boats, painted blue intentionally to blend in a bit with the blue water. It made for a wonderfully monochromatic image. This photo was accepted into the Northwest International Exhibition of Photography at the Western Washington State Fair in September 2007, in the Electronic Imaging category.